Yesterday may have been a bit of a wash-out, but I wasn’t going to let that stop proceedings completely. Today my sister, Katy, kindly offered to join me in visiting a couple of lighthouses along the south coast. Our first was at Southsea Castle where the black and white striped beacon sticks out of the castle wall. Although it’s quite prominent, both Katy and I said that we’d never noticed it before on previous trips to Southsea (my love of lighthouses hasn’t been lifelong), but it’s very clearly there! 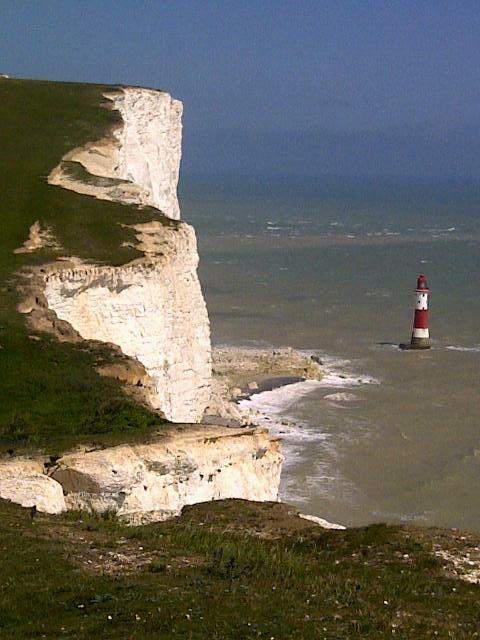 We then went on to Beachy Head and the amazing red and white striped beacon (pictured) at the foot of the chalk cliffs. It was windy, but the sky was clear and it looks stunning (if a little dwarfed by the cliffs). A short walk along the cliff brings you to Belle Tout lighthouse, which sits on the cliff edge. Completely different in style to the Beachy Head lighthouse, it’s now a private residence for some (lucky) people. In my opinion it doesn’t quite compare to Beachy Head, but it’s still a pretty little thing. The characteristic stripes of the Beachy Head lighthouse are now under threat as Trinity House have said that it costs too much to maintain. Their plan is just to allow it to go back to it’s natural grey colour, which I think would be a great shame.